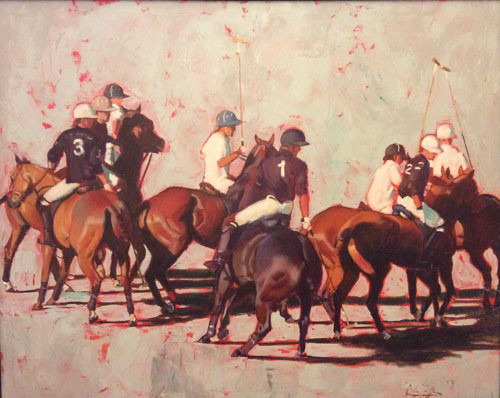 A series of new paintings by the highly-acclaimed and widely collected Argentinian equestrian painter, whose international clientele includes her famous compatriot, the trainer Angel Penna, the American owner Ogden Mills Phipps, Michael Oswald, the manager of the royal stud, and H.M. Queen Elisabeth. Adriana Zaefferer was born in Argentina in 1952, the daughter of a Buenos Aires surgeon. As a schoolgirl, she spent her holidays on her family's property in the foothills of the Andes. Here she developed a veritable passion for horses, and she taught herself to draw them from life of from memory. By the age of sixteen, her obvious talent was recognized by Argentina's foremost owner and breeder Julio Menditegui, who commissioned the precocious adolescent to execute portraits of several of his prize winners. She had originally intented to dedicated her life to veterinary medicine, an ambition she eventually abandoned but which allowed her to devote a good deal of effort to the study of equine anatomy. Having completed her secondary education, the nineteen- year- old Adriana struck out on her own, travelling to Europe where she could rely on family and social connections. From there she went to England, and through the Argentinian ambassador, she was introduced into the society of horse breedinf and racing at Newmarket, a world with which she felt a spontaneous affinity. Her professional career was launched when her work attracted the notice of the trainer Sir Noel Murless, who called her back from spain to pain a portrait of his stallion, Welsh Pageant. Over the next decade or so, she would spend approximately nine months of each year sketching in or around the stables, racetracks and polo fields of Europe, especially Great Britain, returning to South America only during the winter. Without any formal academic training, or even a studio apprenticeship, Adriana Zaefferer has mastered the techniques of pastel drawing, oil painting, printmaking ans sculture, and she has even studied the difficult craft of bronze-casting. At first she specialized in horse portraiture, and a complete listing of her subjects reads like the world's Who's Who of throughbreds. Over the years she has commemorated the beauty of such world-class horses as Alleged, Brigadier Gerard, Bustino, Good Manners, Liloy, Mill Reef, Miss Toshiba, Northern Dancer, Pawneese and Shirley Heights. The artist's international clientele includes her famous compatriot, the trainer Angel Penna, the American owner Ogden Mills Phipps, Michael Oswald, the manager of the royal stud, and H.M Queen Elisabeth, for whom Adriana painted the 1974 Prix de Diane winner Highclere, and her dam, Highlight. 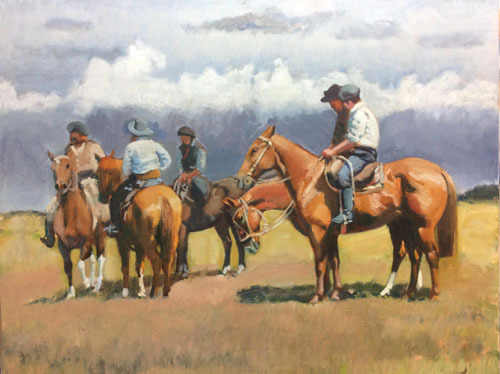 Adriana Zaefferer soon learned to paint groups of horses accompanied by their grooms, trainers, riders and owners, as well as racing scenes and polo contests. Like Munnings, whose influence she readily acknowledges, she succeds in capturing on paper or canvas the individual characteristics of the animals she depicts, their bone structure and musculature, the color and sheen of their coats, their special carriage of gait. In order to fully comprehend the strengths of the horses she paints and to portray them as the graceful, lithe, yet powerful and exciting creatures they are, she will observe them tirelessly, sometimes for days on end, sketching them both at rest and in motion. "What fascinates me about horses," she states rapturously, "is their movements, their action. They are wholly aesthetic. You never see them in a vulgar or disagreeable pose. They are surrounded by a certain aura, which is difficult to explain but which exists nontheless. I think that the most accurate descriptive would be 'romantic.' The horse's personality, the marks of his race, all join so that one is really moved by his presence." To date, the artist has shown her work in exhibitions held in her native Argentina and in England such as The Tryon and Moorland Gallery, Wildenstein Gallery, among others. Paintings by her are in the collections of such renowned connoisseurs of fine horses flesh as Her Majesty Queen Elisabeth II, Paul Mellon, The Countess of Huntingdon, Sir Noel Mursess, Daniel Wildenstein, Princes Ruspoli, Lady Beaverbrook, Robert Sangster, Jeremy Hindley, Lady Halifax, William Triest, Odgen Phipps, Susan Barrantes, Mrs. Priscilla Hastings, among others.